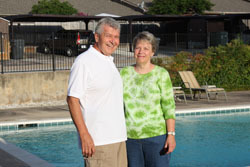 Roger and Peggy Vorholzer have owned AquaCare Pool Service for nearly 40 years. It has grown to serve several hundred customers in the North Dallas, Richardson and Plano areas with weekly cleaning of mostly residential pools (its primary business), but also commercial pools, and all types of repairs. The couple developed AquaCare while Roger studied for a master’s degree in an unrelated field. 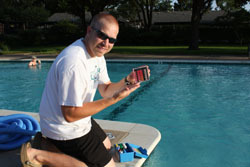 He has been trained as a Certified Pool Operator, and has received more than 200 hours of advanced training. AquaCare has grown to employee 17 full-time and part-time employees. Most AquaCare pool-cleaning employees work part-time while studying for the same master’s degree Roger received. Though AquaCare was noted to be "the pool service" in a June 2000 D Magazine article about living on Beverly Drive (in Highland Park), we still remain competitive with companies and individuals who service the north Dallas and north suburban towns and areas. AquaCare is fully insured for protection of the pool owner and the employee, unlike most individuals and some other service companies. AquaCare specializes in weekly pool cleaning, which sets us apart from many other large service companies. We train our pool cleaners for 30-40 hours in the most complete processes of swimming pool care before making pool assignments to the trainee. We couple that with ongoing review and skill development, with emphasis on seasonal concerns. We have an established supervisory hierarchy and communication system to assist our service personnel immediately, if needed, and provide a system of accountability in maintaining our quality of service. 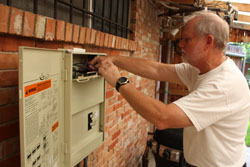 We emphasize communications, and availability to our customers to speak to us directly. We provide the same level of excellence in taking care of other swimming pool needs. We employ a staff of highly qualified technicians and keep those qualifications updated to keep us on the “cutting edge” in order that we may address every need of our regular clientele and those who call us for occasional special services. We sub-contract only a few structural repairs and plastering, using sources that we know and trust. We use only proven techniques, the finest materials and comprehensive procedures for all the services we provide. There are significant differences between the various pool service companies in the Dallas area with respect to the specific services provided for the price each company charges. When you are comparing pool service companies, please be sure to ask what services you are getting for your money. We work extensively to keep your pool water, structure, and system in the best possible condition. In the business world, you don't get (for very long) what you are not paying for. Smart consumers are not only careful to get what they pay for, but also know when not to pick a "bargain." © Copyright 2017 AquaCare Pool Service. All rights reserved.